Karim Djemame was awarded a PhD in 1999 at the University of Glasgow for his research in performance modelling and parallel and distributed discrete event simulation. Since he joined the University of Leeds in 1998 he has worked on various research projects including the EPSRC funded TCP over ATM networking project, the AMOS (Analysis and Modelling of Optoelectronic Systems Architectures) project in collaboration with Heriot-Watt University and the DAME (Distributed Aircraft Maintenance Environment) e-science project. 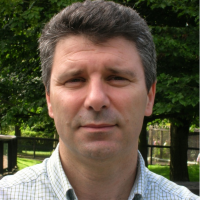 He is currently the investigator of the follow-on DTI funded BROADEN (Business Resource Optimisation for Aftermarket and Design on Engineering Networks) project and the EU project AssessGrid on risk assessment and risk management in Grid computing.